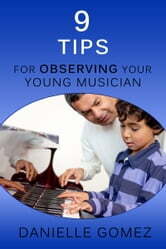 There are three people involved in the education of a young musician: the teacher, parent and child. The role of the parent is the most complex, especially if the parent does not know how to play the musical instrument. The purpose of this booklet is to explore that role and offer strategies for how to take what is taught in the lesson and bring it to the at-home practice session. This manual is approximately 2,300 words long. The Woman’s Handbook: Everything You Want to Say to Your Daughter, Sister, Niece, Friend in One Simple Book. 125 Brain Games for Babies, rev. ed.